Please try to imagine the Peregrine Falcon [pictured] perched on the empty limb outside my kitchen window in Granville Ohio. I swear it was there twice in February but I was not fast enough to get a picture of him! I wasn’t sure what it was at first sighting since they are not common in this area and are still in the category of “threatened” regarding endangered species. I first thought it was a juvenile Red Tailed Hawk. The second time I realized just what I was looking at. 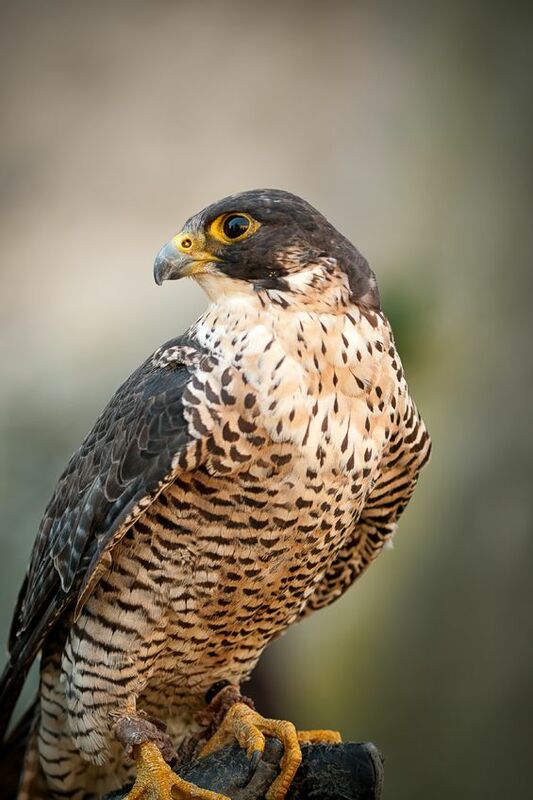 The Peregrine Falcon is the fastest bird on earth. It has been measured at 252 miles per hour in a dive! It would sit facing the house in back where we have a large deck that extends into the woods behind the house. Why it chose that perch became apparent the second visit when I watched him dive below the deck to catch a rodent crawling there with the mistaken opinion it was protected by the overhang of the deck. Not since the falcon showed up! Red Tailed Hawks are the most common Raptors in this area. Turkey Vultures are common but are not hunters and mainly eat already dead animals. Seeing this falcon may be good news for an increase in the local population. Falcons and Hawks are generally seen as having a positive effect on the ecology of an area by reducing the rodent population. They may also eat birds but do not have a negative impact on the population. Except for our client whose cockatiel was snatched by a Red Tailed Hawk right in front of her as she took the bird outside for some fresh air! 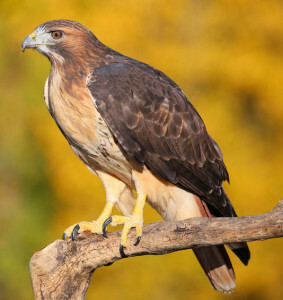 Falcons and Hawks vary a little in their hunting technique. A falcon captures its prey with its talons but immediately finishes the job with its sharp beak. A hawk has longer and more powerful talons and generally grabs its prey and simply grips it tightly with its eight knife like talons until it quickly dies and then begins to eat it or often carries it off. A gruesome display of power if you ever witness it. Spring is right around the corner. For pets that means allergies, bugs, and babies! Dogs will start to lick their feet more if they are sensitive to the new crop of grass. They will itch all over or have a recurrence of an ear infection if they are sensitive to the trees and plants that grow rapidly producing allergens as the season changes. Mosquitos increase in number and peak at the end of the summer depending on rainfall. They are the insect that spreads heartworm disease. The tick season begins and some years reaches its maximum as early as May. Ticks are most prevalent in tall brush. If you are not yet using a tick preventive try to find the ticks and remove them by rubbing your hands over your pet feeling for bumps. Also look in and around their ears since ticks like to hide there out of reach. Ticks are much less common on your cat but they may still have been bitten. A cat’s fastidious grooming finds most ticks and they eat them. Fleas also become active once it is consistently in the 60s or above. Cats once again catch many of the fleas they encounter and eat them while grooming. This is why we treat cats for tapeworms more often than dogs. The Flea Tapeworm (Dipylidium caninum) is by far the most common variety and a flea carrying the tapeworm larvae must be eaten to catch the tapeworm. There is no shortcut by eating the tapeworm. The flea eats the tapeworm egg and your pet eats the flea. You know your cat has fleas if he has tapeworms. You may not see the fleas because the cat ate them all! The increasing length of daylight hours also triggers an increase in estrogen and testosterone in dogs and cats. This leads to heat cycles in females and roaming by males. Roaming leads a number of pets into the street and we see an increase in serious injuries by automobiles. Another reason to spay or neuter your pet. We must spay female dogs when they are not in heat. Their heat cycle increases bleeding during surgery so we need to get to them well before a heat cycle is expected. Spaying females before they start cycling when they are five months of age prevents mammary cancer when they are older pets. They suffer as much mammary cancer as humans when not spayed and spaying at 5 months virtually eliminates the cancer regardless of their heredity. The glands never become activated by spaying early and a dog or cat is mammary gland from arm pit to groin so there is a large area to grow a cancer as they age. Last but not least spring brings a dramatic increase in cases of Parvovirus diarrhea in dogs. This disease can be prevented 100% by proper vaccination of puppies. A vaccination series close to 6,9,12, and 15 weeks of age protects a dog from dying due to this disease. It is still the most common cause of death from infection in puppies and it is preventable. The last vaccination is the most important for long lasting protection but they are all critical in saving your dog’s life if they become exposed when very young. Don’t put off vaccinating a new puppy! Enjoy the sunshine and keep your pet healthy.